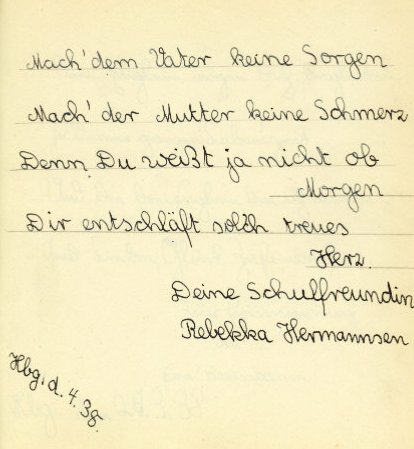 It was 73 years ago this month that a girl named Rebekka Hermannsen wrote this page in her friend's poesiealbum. such dear hearts will pass away. This poem starts off Chapter VIII of The Year of Goodbyes. 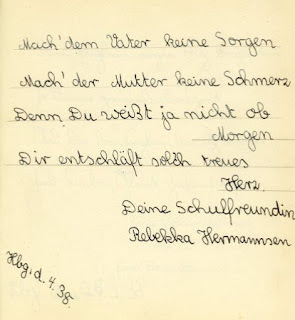 It's a somber poem for an 11-year-old girl to have written to her friend--my mother, Jutta, who was also 11 at the time. Of course, they were living in somber times--1938, in Nazi Germany. Would Rebekka have chosen a different poem in different circumstances? Passover, the Jewish holiday celebrating freedom and commemorating the Biblical story of the Exodus, began in 1938 on the evening of April 15. I don't know whether Rebekka wrote her poesie before or after her family's Passover Seder that year (she didn't write the date, only the month). I don't know whether she wrote before or after being reminded at the Seder of the long history of oppression in human history. At our own Seder this year, I'll be thinking of Rebekka and the other children in The Year of Goodbyes who didn't get to make their own exodus to freedom.